Are you a Simon XT Panel owner, or are you looking to get one in the not-so-distant future? Well, you’re in luck. Welcome to the Simon XT Panel: Most Frequently Asked Questions blog, where we’re going to answer the most popular FAQs surrounding this panel. You’re going to know how to use your panel’s incredible features to optimize your home security. Buckle up, we’re going in! 1 – How can I quickly arm my entry points? Press the Doors + Windows button. Then, if necessary, enter your code. The LCD display will show Doors + Windows, and your panel will also voice the command, and the buttons will light up! Doing this will activate the “exit delay” mode, giving you time to exit your house before the system is completely armed. 2 – How do I arm my motion sensors? Enter your code when the display shows, if a code is required. Your LCD display will then show Motions, the panel will say Motions out loud, and the button will light up. You’ll then have an allotted amount of time to exit the premises before the motion sensors are fully armed. 3 – How can I arm the motion sensors AND the entry points all at the same time? Press the Doors + Windows button first. Then enter your code if necessary. While your Simon XT panel is processing this command, press the Motions button. Your Simon XT Panel will then display Doors + Windows & Motions, speak Doors and Windows On, Motions On, and the Doors + Windows and Motions buttons will also light up. The exit delay mode will then activate with a series of beeps, giving you time to exit the premises before everything is armed. 4 – What is the quick exit feature on the Simon XT Panel? If you ever need to run out to your car for a quick second, or grab the newspaper but don’t want to disarm your system, the quick exit feature is perfect. This feature must be enabled by your installer. When you press the Disarm button, the display shows Exit Time Is On. This allows a designated exit door to be open for up to 2 minutes without triggering an alarm. 5 – How do I bypass a specific sensor? Say you’ve already armed your system before going to bed, then realize you need to open your kitchen window, but don’t want to trip to alarm. That’s where the bypassing features comes in. Press the Bypass button and enter your master code. Scroll until you reach the sensor to be bypassed. The display shows, for example, SN 1 Front Door on the first line. Press OK to bypass (deactivate) the sensor. When a sensor is bypassed, the LCD display on your Simon XT Panel shows “Bypassed” on the second line. 6 – I accidentally set off my alarm. How can I cancel the alarm? To cancel the alarm, enter a valid master or user code. After alarms are canceled, the system will be disarmed. 7 – If I accidentally trip an alarm, how can I make sure I don’t send a message to the central monitoring station? If you accidentally leave your residence after arming the system or forget to disarm the system when you get home, you’ll want to make sure you don’t send a report to your central monitoring station. You can have your installer program a communicator delay, which can be anywhere between 15 and 45 seconds. To cancel an accidental alarm before the programmed dialer delay time expires, enter your access code. It’s that simple. The panel will display Alarm Cancel and make a beeping sound. 8 – What is the default master code? Did your installer set up a default master code and you forgot to change it and personalize it? The default code will be 123, 1234, 12345, or 123456 , depending on the code digit length set. 9 – My Simon XT Panel lost power; how can I reset the proper date and time? Whether your Panel lost power or you’re setting it up, setting the correct date and time is super easy. Scroll until the display shows Set Date, and then press OK. The display will then show Enter Code. Enter your code with the numeric keys, and then press OK. The display will then show the date. Press OK. The display will then flash the year. Scroll to set the year, and then press OK to accept the setting. The display will then flash the month. Scroll to set the month, and then press OK to accept the setting. The display will flash the day. Scroll to set the day, and then press OK to accept the setting. The display will show the programmed date. Also, it’s a good idea to have a backup battery for your system in case of emergencies. Click here to save $5 on a Simon XT backup battery. 10 – How do I enable the chime feature? Scroll until the display shows Chime, and then press OK. The current setting will flash. Scroll to toggle the chime feature on or off, and then press OK. The setting will stop flashing. A solid bell icon will appear in the display when the chime feature is enabled. Consequently, to disable the chime feature, use the same steps. 11 – Is there a way for me to enable the Panel voice so it speaks commands? One of the benefits of the Simon XT Panel is that it can speak commands. Enter the System Programming menu. Scroll until the display shows Siren Options, and then press OK.
Scroll until the display shows Panel Voice, and then press OK. The current value of this option flashes (On or Off). Scroll to the desired value, and then press OK.
12 – How often should I test my sensors? You should test your sensors once a week to make sure they are properly working! 13 – How can I properly test my sensors? Scroll until the display shows System Test, and then press OK. The display shows Enter Code. Enter your master code, and then press OK. The display shows Sensor Test. Press OK. The display automatically shows the list of sensors to be tested. The panel sounds 6 beeps once a minute while in sensor test mode. Trip the sensor. When you trip a sensor the display shows, for example, SN 1 Packets = 8 Front Door. You may trip the sensors in any order. As each sensor is heard from, it is removed from the list of sensors to be tested. After all sensors have been successfully tested, the display shows SN Test Complete. Press Status. The display shows Sensor Test OK. Then after a few more seconds, the display shows Sensor Test. Press Status repeatedly to exit. If any of the sensors didn’t test successfully and you want to terminate the test, press Status. The panel displays Sensor Test Fail or Aborted. The display then shows Sensor Test. Press Status once to exit the system test. If a sensor test fails, call your security dealer. 14 – The Status button light is on. What does that mean? This could mean system trouble, a sensor is open, or a sensor has been bypassed. 15 – My system is beeping 6 times every minute and not in sensor test mode. What does that mean? 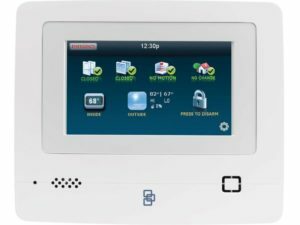 Learn all about your Simon XT Panel so you can use all of its best features and maximize your home security. To learn more about your Panel, click here to head on over to the user manual. Also, feel free to leave a question below about the Simon XT and we’ll answer it!